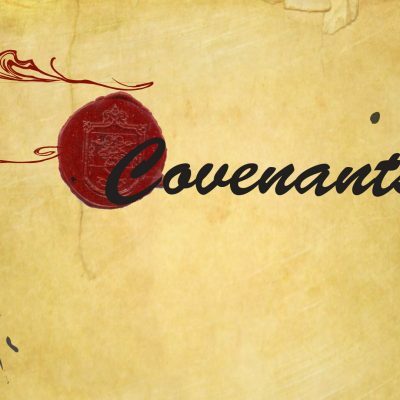 The Lord made this conditional blood covenant with Moses and with the people of Israel. It promised the Israelites a blessing for obedience and a curse for disobedience. It builds on the Abrahamic Covenant and is fulfilled by Jesus return to earth. You yourselves have seen what I did to the Egyptians, and how I bore you on eagles’ wings and brought you to myself. Now therefore, if you will indeed obey my voice and keep my covenant, you shall be my treasured possession among all peoples, for all the earth is mine;  and you shall be to me a kingdom of priests and a holy nation. These are the words that you shall speak to the people of Israel.”  So Moses came and called the elders of the people and set before them all these words that the LORD had commanded him. All the people answered together and said, “All that the LORD has spoken we will do.” And Moses reported the words of the people to the LORD. It was a long list of commandments (some add it up to 613), including the 10 commandments, called the Law, that they would need to obey in order for God to bless them. Israel were supposed to be a nation of priests to the whole world. If they broke the commandments they would be cursed and God would scatter them through their enemies. In times of obedience they prospered and in times of rebellion they suffered! Many times the Israelites were punished and even scattered because of disobedience – Assyrians, Babylonians and the Romans after the Jews refused to accept Christ as their Messiah. The top two were the real desires of God – relationship! To teach us that righteousness and salvation can only come by faith in God! So all Israel is obliged to obey all the law but no one can. Therefore it was there to show them that righteousness can only come through faith! So then, the law was our guardian until Christ came, in order that we might be justified by faith. But now that faith has come, we are no longer under a guardian,  for in Christ Jesus you are all sons of God, through faith. Jesus did not come to abolish the Law, but to fulfil it! That is why He got baptised by John the Baptist. IMAGINE A HOUSE OF 12 KIDS WHERE ONLY ONE DOES EVERYONE’S CHORES BUT THEY ALL GET THE REWARD. For what the law was powerless to do because it was weakened by the flesh, God did by sending his own Son in the likeness of sinful flesh to be a sin offering. And so he condemned sin in the flesh,  in order that the righteous requirement of the law might be fully met in us, who do not live according to the flesh but according to the Spirit. For if the blood of goats and bulls, and the sprinkling of defiled persons with the ashes of a heifer, sanctify for the purification of the flesh,  how much more will the blood of Christ, who through the eternal Spirit offered himself without blemish to God, purify our conscience from dead works to serve the living God. We don’t have to obey all 613 laws, as Jesus has fulfilled them. Many were just for the Jews, for the land or for seasons, etc. But God’s principles (10 commandments) still stand. But even better – a relationship with Jesus!